This past weekend movie-goers finally got to see the world premiere of First Man, a movie based on the biography with the same title telling the life story of Neil Armstrong, the first man to step onto the surface of another world. Prior to the movie’s release there was some controversy when Ryan Gosling, the actor playing Armstrong, said that they had left out the scene on the Moon when the astronauts planted the American Flag because their goal was to highlight Armstrong’s personal story as well as the global nature of the achievement. I decided I had been unfair to criticize the film without seeing it, and decided I would make a rare trip to a movie theater as soon as it was released to see it and then review it. The filmmakers for the Neil Armstrong biography film, First Man, made a conscious decision to hide or obscure the American flag in certain situations. This new information has been provided to me by a Washington consultant who, because of his own outrage over their decision to not show the planting of the American flag during the lunar landing, had been given the opportunity to see selected clips from the movie as well as ask questions to the production team. According to that meeting, he learned that they had consciously made the decision to either reposition or remove American flags from the blue flight suits that the astronauts wore from day to day so that it would not be visible. The image on the right, from the movie, illustrates this, as the American flag was almost always sewn into the upper left shoulder of these suits. The filmmakers also purposely repositioned the flag or filmed angles for many scenes that acted to obscure the flag on the astronauts’ white pressure suits. The reasons the filmmakers gave for doing this was to enhance their foreign ticket sales. To this I say, baloney. They might have had this financial excuse, but I think this holds little or no weight. By willingly admitting that they hid the flag in this petty way they have confirmed their political agenda, their desire to convince the world that this mission was not an American achievement but a “human achievement.” Both the film’s Canadian star as well as its director have made it clear they have a globalist vision of the Apollo program, and wanted to spread the credit of its achievement to all humanity. Consciously hiding the flag in this small-minded manner demonstrates their political motives. 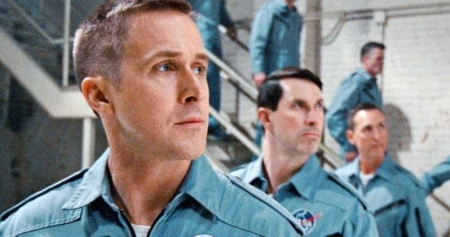 Moreover, even though the director, Damien Chazelle, might have wanted to focus on “Neil Armstrong’s personal saga and what he may have been thinking and feeling during those famous few hours,” removing or obscuring icons of the United States serves no purpose other than to remove the United States from this decidedly American moment. Showing the flag on the flightsuits and pressure suits does not make this a jingoistic pro-American propaganda film. Nor does it do anything to prevent Chazelle from telling Neil Armstrong’s personal story. In fact, if anything, hiding the flag detracts from that goal, as Armstrong was very much doing this for his country (as numerous people who knew him have said), and to de-emphasize that reality is to rewrite history in a very dishonest way. The pettiness of this entire action further outrages me. There is no doubt that sales would not have suffered in foreign countries, in the slightest, had the American flag been left where it belonged on these suits, and had been shown appropriately in other scenes. It accomplishes nothing positive for the film. What it does do is tell us what these Hollywood “artists” think of America. So that there is no misunderstanding, I must add that neither my source nor I have as yet seen the entire film. It is still possible that these criticisms are unfair, and that the filmmakers might have shown the American flag appropriately in other scenes, and might even have shown it prominently. Nonetheless, what we now know is that these filmmakers did made a conscious effort to rewrite history so that the United States no longer appeared as prominent in these events as it should have. Once again, it appears to me that these Hollywood filmmakers did this to express their disdain, almost hatred, of the United States and all that it stands for. For this fact alone I think Americans should reconsider spending any of their hard-earned money on seeing this propaganda piece. The director of the movie about Neil Armstrong, First Man, has issued a statement about criticism the movie is getting for not showing a scene of Armstrong and Aldrin planting the American flag on the Moon. That he did show the American flag on the Moon is encouraging to me, and makes me think that the criticisms about this issue being leveled at the film, including mine, are possibly unfair. At the same time, I have witnessed too often the desire of Hollywood to denigrate the United States, so I remain suspicious. Getting eyes on the film to get another perspective would I think be very helpful. I might myself have to view it to give my own perspective. The just released new Hollywood movie detailing the life of Neil Armstrong, First Man, has so far gotten rave reviews. Sadly, however, there is one detail about the Apollo 11 mission that the filmmakers decided they couldn’t include, even though it was in many ways the entire point of the mission. They made a conscious decision to exclude any mention of the planting of the American flag on the surface of the Moon. This is bunk. All the astronauts who flew to the Moon were very aware that they were warriors in the Cold War against the Soviet Union and communism, and did it very consciously so that the U.S. could win that space race, for the U.S. Planting the flag was thus for them a very important aspect of the mission, maybe in many ways the most important. This makes me very unwilling to spend any money to see this movie. Why should I support the work of such intellectually dishonest people? I must add that I have already been emailed by several readers who are similarly outraged. I wonder therefore if this will turn into something that will actually hurt ticket sales. I suspect not, as too many Americans today do not care very much about these issues. They will go to be entertained, and many will buy into the lie that the Apollo missions was an achievement not of America but of the entire global world, working together in love and peace. Congress has now officially renamed the Dryden Flight Research Center in California after Neil Armstrong. The U.S. Senate on Wednesday (Jan. 8) passed a bill that redesignates the space agency’s Dryden Flight Research Center in southern California the “NASA Neil A. Armstrong Flight Research Center.” The legislation continues to honor the facility’s displaced namesake by renaming the surrounding area the “Hugh L. Dryden Aeronautical Test Range.” The U.S. House of Representatives earlier introduced and passed a corresponding resolution in February 2013. This was at least the third time since 2007 that Congress has sought to name the flight research center for Armstrong. On Thursday, the bill was presented to the President to be signed into law. It still seems unseemly to me to remove the honor from Dryden. I would rather give Armstrong a better memorial, on the Moon. The House passed legislation Monday proposing to rename the Dryden Flight Research Center in California after Neil Armstrong. Don’t they have better things to do? The House passed legislation Monday proposing to rename the Dryden Flight Research Center in California after Neil Armstrong. As much as I think Armstrong should be honored in as many ways as possible, it seems cheap and inappropriate to take the honor away from Hugh Dryden, whose work helped make Armstrong’s lunar mission possible. Moreover, Armstrong, being a very modest man himself, would likely be quite appalled by any action that would rob someone else of a memorial in order to give it to him. Neil Armstrong’s ashes were buried at sea today. R.I.P. Neil Armstrong’s ashes were buried at sea today. Americans say goodbye to Neil Armstrong. According to a family spokesman, Neil Armstrong is to be buried at sea. A public memorial service for Neil Armstrong has been scheduled for September 13 in Washington, D.C.
A special Iowahawk guest commentary by Barack Obama, stargazer-in-chief. Neil’s passing gives all of us all pause to consider deeper questions. What does it mean for the future of space exploration? How proud would Neil have been to have a famous historic president refer to him by first name? And, most importantly, how did his death inspire that historic president to make ever more gigantic leaps for mankind? The commentary might be satire written by Dave Burge, but the photo at the link is real, our President’s idea of honoring Neil Armstrong, with a photo of himself. Not the same kind of photo legacy that Neil Armstrong left us. The photo legacy of Neil Armstrong. An evening pause: This short clip from the Discovery Science series Rocket Science illustrates one reason Neil Armstrong got the job to land the first spacecraft on the Moon, even though it shows Armstrong crashing his test vehicle! The man was cool-headed. Not only did Armstrong not panic when a thruster failed, he kept trying to regain control of the craft until the last moment, ejecting less than a second before impact. Then, he was calm about it afterward, hardly mentioning the incident to others. In space, science, and technology, there really is very little new news to report today. Instead, almost all the stories are about the passing of Neil Armstrong. On spacetoday.net alone I count almost seventy stories on Armstrong, practically everything posted since yesterday, And that is only a sampling. This response tells us several things. Tomorrow, Monday, August 27 at 7:30 pm (Eastern), I will be joining David Livingston of the Space Show and the One Giant Leap Foundataion on the John Batchelor Show to talk about Neil Armstrong and his life and impact on history. If you can’t listen live, the podcast of the show will be available here one hour later. I think the gracious statement by Neil Armstrong’s family sums up his life quite well. Neil Armstrong was recovering today from heart bypass surgery. All the best: Neil Armstrong was recovering today from heart bypass surgery.